Through the years we have had a whole slew of books dedicated to discovering the science or maths used in a fiction book, movie or TV show – think, for instance of The Physics of Star Trek or The Science of Middle Earth. And at first sight, Simon Singh’s new book (which he tells me has been brewing in his mind for a good few years) is more of the same, but in fact it takes rather a different approach. Where the other books look for the science etc. 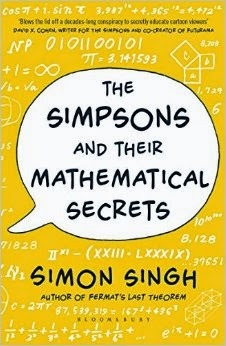 inherent in the world created in the storyline, Singh’s new title picks out the mathematics explicitly incorporated by the writers into the Simpsons (and in its companion show, Futurama, to which the final few chapters are dedicated). I confess I haven’t much time for Futurama, but despite having always enjoyed the Simpsons, I hadn’t spotted the unusually high level of mathematical content, the result of several of the writers having maths, science or computer science backgrounds. Sometimes it manifests in just a passing reference – perhaps the title of a book glimpsed for a second, or something written on a blackboard in the background. At others the maths is central to the storyline. In some ways, what should be a ‘best of both worlds’ crossover book that appeals to both Simpsons fans and maths nerds (publishers love crossover books) is in danger of being the opposite kind of product (I mean product in a mathematical sense – how else? ), by being a book that only appeals to maths nerds who are also fans of the Simpsons. As I almost qualify for this, I was going to enjoy reading it anyway, but what saved it from being the mathematical equivalent of trainspotting (‘Did you know that in episode #382, the number 47 is referred to ironically as a square, even though everyone knows it isn’t, fnaar, fnaar!’*) was Singh’s indubitable writing skill and ability to bring in interesting asides and deviations. Popular maths will always have a smaller audience than popular science for good reason, but if you have only the smallest interest in maths and some enjoyment of either the Simpsons or Futurama you should find this an excellent entertainment, and certainly a revelation when it comes to the lengths that the writers will go to get some little mathematical reference in.